Acne is a skin condition in which there is excess production of oil from the sebaceous glands leading to the blockage of hair follicles. It is the most common problem of adolescents, and is therefore known as Yauvanpidika in Ayurveda; yauvan means ‘adolescence’ and pidika means ‘pustules or papules’. Acne usually affects the face, back and shoulders and other areas that are densely populated with sebaceous glands. Acne presents either as blackheads, whiteheads, pimples or nodules. Ayurveda treats yauvan pidika as a disorder that is due to an internal constitutional imbalance. As it is not infectious or contagious in nature, it is not considered to be caused by microorganisms. The cause is attributed to the general constitution of the person. The Ayurvedic cause of acne or yauvan pidika is aggravated Vata and Kapha doshas. The Pitta doshamight also cause acne when it starts to circulate and accumulates there. Tis causes the capillaries to become inflamed. This is why people who have acidic sweat or too much Pitta under the skin have a higher tendency for acne. Another possible cause is the increase of rakta (blood) and mamsa (muscle) dhatus. As Ayurveda believes that yauvan pidika is a disease caused by internal factors, let’s take a look at the factors. An improper diet is the primary cause of acne.It is fairly common in those who suffer from constipation and indigestion Similarly, those who prefer spicy, sugary or oily food tend to get acne. Faulty eating habits can also cause acne. Adhyashana – Eating at short intervals, due to which the food previously consumed isn’t fully digested. Viruddhashana – Consuming incompatible foods such as fruit and milk, meat and milk, etc. Vishamashana – Eating with disregard for the body’s wants and needs, such as taking food when not hungry or fasting when hungry. Deficiency of Vitamin A can be the cause of acne. Women with menstrual problems such as irregular menses can suffer from acne. While acne is quite common in all women, the problem is exacerbated in those whose periods are delayed. Irregular sleeping habits which disrupts the body’s natural rhythms and causes metabolic imbalance leading to toxin overload and acne. Overuse of cosmetics which can impact the health of facial skin. 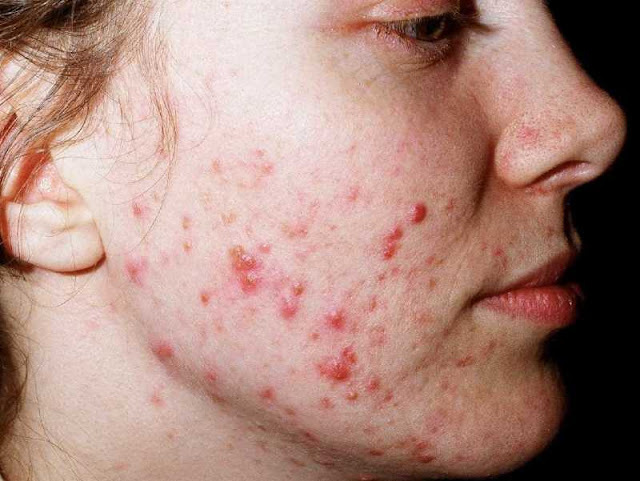 Vata Acne -Vata is characterised by dryness. An imbalance in vata results in poor digestion and the accumulation of toxins. Pitta Acne -Pitta acne is characterised by redness and excess heat. An imbalance in pitta affects the blood and liver, resulting in inflammation. Kapha Acne- Kapha is concerned with oiliness instead. An imbalance in kapha means excess sebum is produced and overwhelms the pores so they become clogged. 1. Comedones - Enlarged, plugged hair follicles. If the comedone is under the skin, it's a whitehead. If it breaks the surface of the skin, it's a blackhead. 2. Whitehead - Whiteheads are clogged hair follicles that contain oil (sebum) and look white. 3. Blackhead - Blackheads are clogged hair follicles that contain both oil (sebum) and tightly packed skin cells. Although blackheads look black, they do not contain dirt. 4. Pimples - Inflamed pus-filled lesions that are red at the base. Pimples look red and often are raised above the level of the skin. 5. Cystic acne - One of the most severe forms of acne, cystic acne occurs when the infected contents of a pustule or pimple erupts beneath the skin, rather than on the surface. Ayurveda has a singular approach to all forms of acne as this problem appears due to imbalance of the three doshas — vata, pitta and kapha. However, the main cause is the aggravation of the pitta dosha, an Ayurvedic humor that symbolizes heat or fire. Pitta dosha manifests in the skin and causes accumulation of heating toxins. These heating toxins accumulate in deep tissues like rasa (nutrient plasma), rakta, (blood), mamsa (muscles) and lasika (lymphatic). These toxins cause contamination of deeper tissues, leading to the condition of acne. Because acne is deep-rooted, use of local creams, antibiotics and lotions only masks the symptoms. Thus, specific Ayurvedic treatment is advised which includes right diet, lifestyle and some special herbal combinations that tackle the disease from its root cause. Ayurvedic treatment for acne is based on the conclusion that acne breakouts are primarily a result of eating disorders. Although hormonal imbalances are not ruled out as causes, faulty eating habits are named the main reason. Hence ayurvedic treatment for acne is centre on some very vital food intake restrictions as well as administration of special herbs for containing the problem. Avoid excess meat, sugar, tea or coffee, condiments, pickles, soft drinks, candies, ice cream, refined and processed foods. Have lots of lemon juice, coriander soup, mint juice & water. Go for a fat-less diet with plenty of green salads and fruits. Avoid dairy as the animal hormones in milk might set off cystic acne. Foods containing urad dal like idli and dosa must be minimized. Wash your face with lukewarm water, with a neem-based soap twice a day. Try to meditate and stay stress-free as far as possible. Maintain regular timings for food and sleep. Do not scratch or squeeze to avoid scars.